Massive Attack are a collaborative British music production duo from Bristol. Working alongside co-producers, various favoured session musicians and guest vocalists, they make records and tour live. The duo are considered to be progenitors of the trip hop genre. Originally three in number, DJs Grantley "Grant" Marshall (a.k.a. Daddy G or "G"), Andrew "Andy" Vowles (a.k.a. Mushroom or "Mush") and graffiti artist-turned-MC Robert Del Naja (a.k.a. 3D or "D") met as members of DJ/MC collective, The Wild Bunch. One of the first homegrown soundsystems in the UK, The Wild Bunch became dominant on the Bristolian club scene in the mid-1980s. 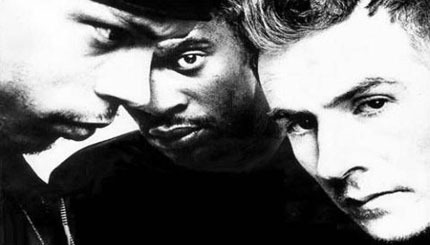 Massive Attack itself started as a spin-off production trio in 1988, with the independently-released song, "Any Love", sung by falsetto-voiced singer-songwriter Carlton McCarthy, and then, with considerable backing from fan-of-theirs Neneh Cherry, they signed to Circa Records in 1990 – committing to deliver six studio albums and a "best of" compilation. Circa became a subsidiary of, and was later subsumed into, Virgin Records, which in turn was acquired by the now Terra Firma-owned major, EMI.